Researchers from Aarhus University, Denmark, and Copenhagen Zoo have discovered that the human mutation rate is significantly slower than for our closest primate relatives. This new knowledge may be important for estimates of when the common ancestor for humans and chimpanzees lived—and for conservation of large primates in the wild. Over the past million years or so, the human mutation rate has been slowing down so that significantly fewer new mutations now occur in humans per year than in our closest primate relatives. This is the conclusion of researchers from Aarhus University, Denmark, and Copenhagen Zoo in a new study in which they found new mutations in chimpanzees, gorillas and orangutans, and compared them with corresponding studies in humans. Using whole-genome sequencing of families, it is possible to discover new mutations by finding genetic variants that are only present in the child and not in the parents. "Over the past six years, several large studies have done this for humans, so we have extensive knowledge about the number of new mutations that occur in humans every year. Until now, however, there have not been any good estimates of mutation rates in our closest primate relatives," says Søren Besenbacher from Aarhus University. The study looked at 10 families' fathers, mothers and offspring: seven chimpanzee families, two gorilla families and one orangutan family. In all the families, researchers found more mutations than would be expected on the basis of the number of mutations that would typically arise in human families with parents of similar age. This means that the annual mutation rate is now about one-third lower in humans than in apes. 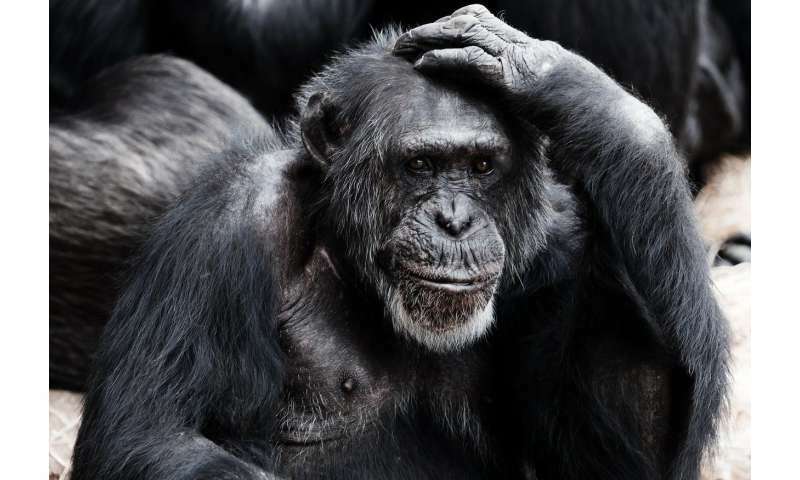 The higher rates in apes have an impact on the length of time estimated to have passed since the common ancestor of humans and chimpanzees lived. This is because a higher mutation rate means that the number of genetic differences between humans and chimpanzees will accumulate over a shorter period. If the new mutation rates for apes are applied, the researchers estimate that the speciation that separated humans from chimpanzees took place around 6.6 million years ago. If the mutation rate for humans is applied, speciation should have been around 10 million years ago. "The times of speciation we can now calculate on the basis of the new rate fit in much better with the speciation times we would expect from the dated fossils of human ancestors that we know of," explains Mikkel Heide Schierup from Aarhus University. The reduction in the human mutation rate demonstrated in the study could also mean that we have to change the estimate for the split between Neanderthals and humans to be closer to the present. Furthermore, the results could have an impact on conservation of the great apes. Christina Hvilsom from Copenhagen Zoo explains: "All species of great apes are endangered in the wild. With more accurate dating of how populations have changed in relation to climate over time, we can get a picture of how species could cope with future climate change." The study, "Direct estimation of mutations in great apes reconciles phylogenetic dating" has been published in Nature Ecology and Evolution.